An artist's depiction of a small satellite being developed by Boeing called a Phantom Phoenix, that can quickly and affordably be manufactured and configured for specific missions. Small satellites are currently one of the major areas of growth in the space industry. WASHINGTON — Boeing Phantom Works, the research arm of the U.S. aerospace giant’s sprawling defense business, is introducing a new line of small-satellite platforms featuring common avionics and software in hopes of tapping what company officials see as a multibillion-dollar market in the years ahead. The Phantom Phoenix line of platforms would range anywhere from several to 1,000 kilograms in weight and could be adapted for short-term experiments or operational missions lasting up to seven years or more, said Bruce Chesley, director of advanced space and intelligence systems at Phantom Works. The demand Boeing sees is mostly within the U.S. Defense Department and intelligence agencies. The company also is betting that the so-called disaggregation of space, whereby big multimission satellites are replaced by constellations of smaller, cheaper spacecraft, becomes a reality. The company also sees a commercial market, where a number of entrepreneurial satellite-based ventures for services such as imaging and data relay have sprung up in recent years. Phantom Works officials envision the Phantom Phoenix spacecraft line to open up applications that might not have even been considered in the past. 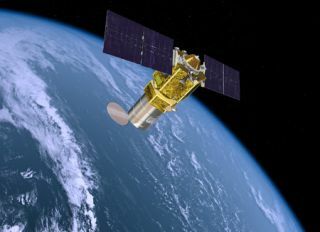 They drew comparisons to the 702SP operational satellite platform recently introduced by Boeing Satellite Systems, which features an all-electric propulsion systemto enable missions that normally require a satellite twice its size and weight. While Boeing is not known as a maker of small satellites, its divisions have built a number of small experimental platforms for the Defense Department, including the Orbital Express satellite servicing demonstration. While Phantom Works plans to leverage this and other small-satellite work, the real key to Phoenix is the common avionics and software package, developed with internal research and development funding, which company officials say is compatible with a wide variety of off-the-shelf hardware components in any number of configurations. Phantom Works has built some hardware prototypes, but Phantom Phoenix is still in an early development phase. The company is talking with prospective customers but has yet to land any firm orders, officials said. If the product catches on, it would be transferred to Boeing Satellite Systems of El Segundo, Calif., for marketing and production in accordance with the operating model of Phantom Works, whose divisions feed technology directly into corresponding manufacturing divisions of the parent company. But even if Phantom Works succeeds in demonstrating it has truly developed a low-cost, versatile small-satellite platform, Phoenix faces tough market barriers. For one thing, not everyone agrees with Davis’ assessment of the size of the potential market. Another major hurdle is the lack of low-cost launch opportunities for satellites in the Phantom Phoenix weight range. One option cited by company officials is the adapter ring that enables the U.S. Air Force’s workhorse Atlas 5 and Delta 4 rockets to accommodate multiple secondary payloads, but actual flights of that hardware have been few and far between since its introduction several years ago. Davis suggested there are more launch opportunities available than meets the eye, but declined to be specific. Phantom Works officials also cited new commercial vehicles entering the market, such as Space Exploration Technologies Corp.’s medium-class Falcon 9 rocket.